Home > News > News > Time 4 GDA – What is a glucose disposal agent? What is a glucose disposal agent? Glucose is the body’s preferred fuel. It comes from the breakdown of the carbohydrate we consume and is the predominant energy source for high intensity activities lasting from 30-seconds to approximately 90-120 seconds, such as performing a set of 8-20 repetitions of a resistance exercise at a high intensity, or 30 second maximal sprints. Glucose disposal agents (GDAs) are substances that aid the uptake of glucose from the blood stream into the muscle tissue where it can be used immediately to fuel activity, or can be stored in the muscles and liver as glycogen to provide energy when needed later. GDAs increase muscle cells sensitivity to insulin therefore reducing the need for high levels in the blood and helping to ensure that the carbohydrate we consume is used as fuel for activity rather than stored as body fat, and so potentially enhance performance, recovery, and body composition. Reducing the levels of glucose and insulin in the blood can provide many health benefits as both high levels of blood glucose and insulin sustained for long periods are related to a variety of serious health problems. 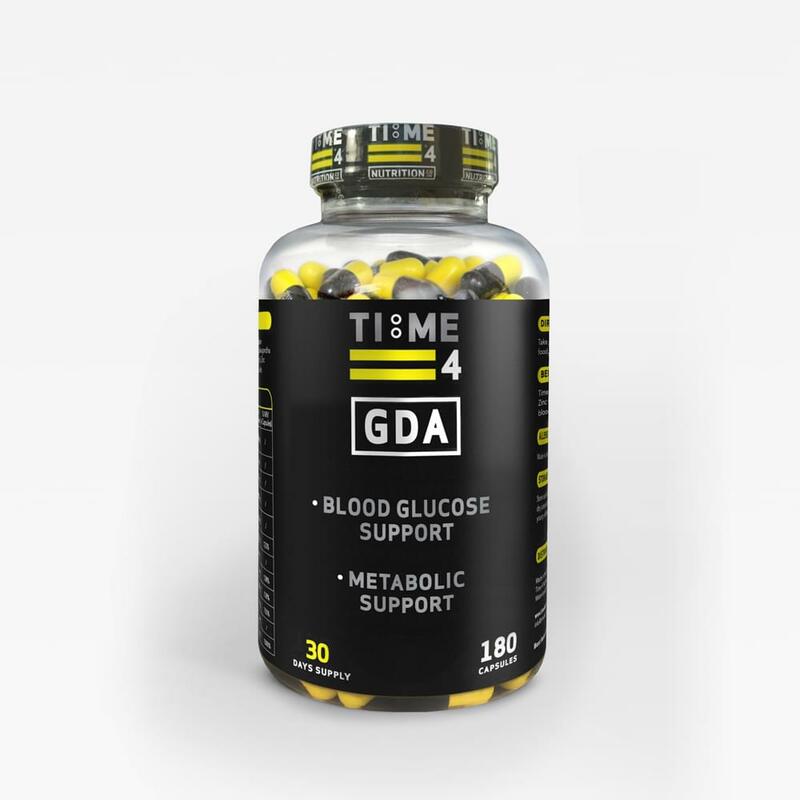 Why use Time 4’s glucose disposal agent? The key ingredients of Time 4’s glucose disposal agent have been shown scientifically to provide a number of benefits for health and performance. ‘Blood lipids’ is the term used for all the fatty substances found in the blood, including cholesterol and triglycerides. Some people have too much cholesterol (fat) in their blood, which increases their risks of developing cardiovascular disease. The term ‘body composition’ refers to the fat, bone, water and muscle content of the body. Glucose is a simple sugar which is an important energy source in living organisms and is a component of many carbohydrates. Glycogen is the stored form of glucose. It is made up of many connected glucose molecules, which can be broken down to release energy. The term ‘hyperglycaemia’ refers to abnormally high glucoses levels in the blood. It is a sign of both type 1 diabetes and type 2 diabetes and prediabetes. Hyperinsulinemia is a condition in which there are excess levels of insulin circulating in the blood relative to the level of glucose. Insulin is a natural hormone made by the pancreas that controls the level of the sugar glucose in the blood. It mediates the uptake of glucose into adipose tissue and skeletal muscle. The term insulin resistance refers to the diminished ability of cells to respond to the action of insulin in transporting glucose from the bloodstream into muscle and other tissues. Lipoproteins are combinations of fats (lipids) and proteins, and are the form in which lipids are transported in the blood. Elevated levels of low-density lipoprotein , commonly referred to as ‘bad’cholesterol are associated with an increased risk of heart disease. Muscle atrophy is defined as a decrease in the mass of the muscle. Oxidative stress is essentially an imbalance between the production of free radicals and the ability of the body to counteract or detoxify their harmful effects through neutralisation by antioxidants. Triglycerides are a type of fat (lipid) found in the blood, which mainly come from food.